From Garsdale Station walk down the road to the T junction with the main Hawes - Sedbergh road. Immediately on the other side of the T junction look for a stile in the wall. Passing through the stile proceed uphill across the rough pasture and another stile. The ground starts to level out a bit. Proceed for a short while passing through a gate to the right hand side of Blake Mire Farm. Proceed in the same direction across more rough pasture and collapsed walls to Rowantree, now a track, crossing a small stream and thence uphill across pasture through a gate to Moor Rigg at which point the minor road serving Grisedale is reached. Bear right and follow the road uphill to East House, The road passes through a gate and becomes a track at this point zig-zagging up the hill with a wall on the right. When the track levels out slightly bear left at a waymark post and proceed uphill to the crest of the open pasture [can be difficult to follow] or keep to the track as it works its way around to the crest of Grisedale common and a wall in effect in a large loop. If the latter easier route is followed, upon meeting the wall at the top, bear left and proceed with the wall on the right. Ignore the first gateway and stile and follow uphill for 500m. 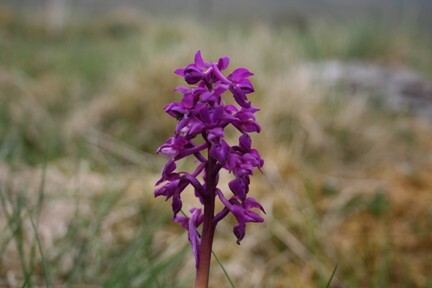 Both routes, either direct or indirect, should eventually reach a metal bridleway gate on the crest of the ridge. With luck you will pass a few fell ponies enroute. Passing through the metal gate now proceed down hill bearing left and contouring around the hillside. Sometimes this path is difficult to spot but the objective is to eventually proceed in a northerly direction dropping downwards to meet a wall and barn. At this point the path will be paralleling the railway line all the way to Aisgill. Pass to the right hand side of the barn and continue along an easy path to Aisgill through a gate and to the road. Bear left along the road for 100m and then turn right [just before the cottages] along a track passing over the railway line. The track bears left and at then right. At this change in direction make a slight deviation to Hellgill Force, a spectacular waterfall with a good vantage point and possible lunch stop above. This feature is easily missed as it is located below the track. Take the right hand track and proceed up the hill across a bridge through a farm to Hell Gill Bridge turning right to cross a very narrow and deep ravine. This track is the old coach road known as Lady Anne Highway. Follow the gently undulating 'highway' in a southerly direction taking the left hand fork [at a vehicle prohibition sign] eventually with a wall to the right. After 1 mile the ruin of High Hall is reached and a ford. Another 2/3 mile further along the highway reaching a gate across the track. 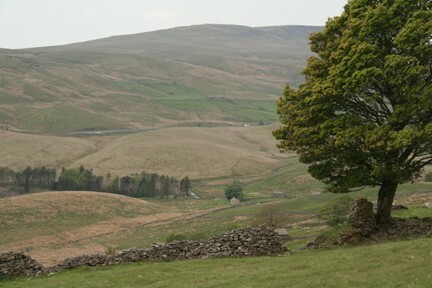 There are two main options for the return either using the Pennine Bridleway or via Lunds. The easiest involves passing through the gate and carrying on along the highway. The track dips into a small ravine and has been subject to landslip in the past. About 1/4 mile after the ravine look for a new gate in the wall together with Pennine Bridle Path sign post. Pass through the gate with a lime kiln on the left. 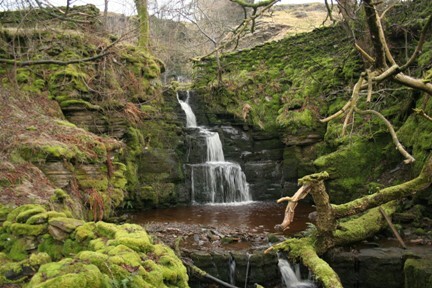 The bridleway is waymarked with wooden posts down to the side of Cobbles Plantation and emerging at Ure Force waterfalls. Cross the bridge and follow the bridleway to the Moorcock Inn. 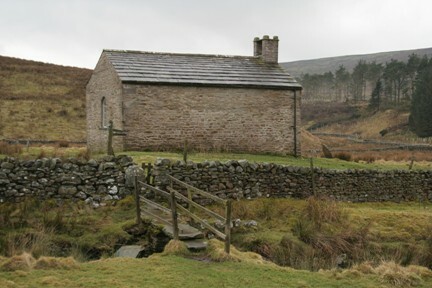 The second option takes in Shaws Waterfall and Lunds Church: Passing through the stile immediately before the aforementioned gate on Lady Anne Highway proceed directly and then diagonally downhill to a gate at the rear of Shaws and the by steps (take care as can be very slippy!) down to a wooden footbridge in front of the waterfall. 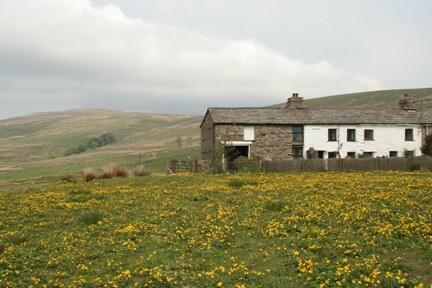 Shaws, now a private house was formerly the Garsdale Youth Hostel until the 1970s. Continue downhill across another footbridge and passing through a farmyard to the little hamlet of Lunds with it's now disused and privately owned church. The church (open to visitors) and graveyard are worth investigation. Bear left at the church and passing through a stile over Cowshaw Hill and two more stiles. This now becomes difficult to follow and some map reading is required! With the pasture boundary on the right look for a stile at the slight change in direction. Turn right to pass over the stile and then immediately left passing over very rough pasture towards Blades, a small hamlet of cottages. The path has been redirected pass to the left (rear) of the farmhouse through two stiles and crossing a small stream joins the farm access track. At a right hand bend in the track go straight on following the left hand bank of the River Ure. Eventually the path will meet Ure Force waterfalls and an old bridge with it's modern replacement alongside. Cross the bridge and follow the Pennine Bridleway to the Moorcock Inn. 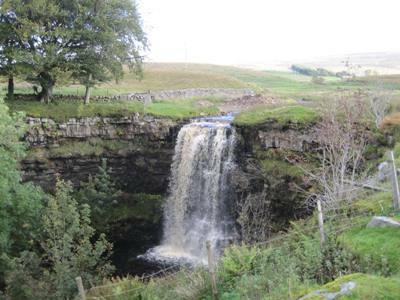 Please note that this latter option whilst having the attraction of a visit to Shaws waterfall and Lunds Church can be unpleasantly muddy between Lunds and Blades Farm. For the return walk to Garsdale Station, on leaving the Moorcock turn right and proceed along the main road towards Sedbergh for a very short while, then turning left through a gate to follow the Pennine Bridleway which proceeds directly to the rear of the station passing under Dandry Mire Viaduct enroute. The station is slightly under a mile from the pub and 30 -35 minutes should be allowed for this uphill walk! Remember that southbound trains run from the farthest platform and it is necessary to pass under the road bridge to gain access.